We are nearing the end of our renovation of the cottage we bought in Bowral in May and it will soon be ready to go on the market. It is looking fabulous and we are really thrilled with the way it has come together. Somebody is going to absolutely love it, and it will be hard to let go as we have become very fond of our little home away from home. Here’s a few teasing snaps of the work in progress and showing what we’ve done so far. The big reveal should be about a week away….! The cottage consists of three bedrooms, two bathrooms, with laundry, living/dining room and kitchen with separate garage and studio/workshop, set on a level near 1000 sqm block. The original house is a mix of cedar shingles and siding boards, with a tiled roof and shutters. The house was painted dark brown, with terracotta roof and avocado green trim. It is only minutes to town, almost next door to the hospital and local cafes, on a terrific level block with some established trees and nice hedges. Nothing like a new signature gate (which Tom and I built together!) to add street appeal, and our lovely new fresh colour scheme to give it a much need lift and update. 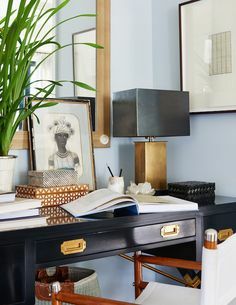 Lots of crisp white trim, a gorgeous grey blue wall colour, charcoal roof and brass wall lights. We added the new criss cross balustrade which is the same design I came up with for our house, and thought we would replicate it here as a bit of a signature feature on our renos. It has been a lot of hard work, a little stressful and challenging at times, but on the whole has been a very rewarding and fun experience. As it turns out Tom and I make a great team and have had terrific fun working on this project together, each exercising our different skills but working toward the same goal. We have learnt so many lessons, made plenty of mistakes, regretted a few decisions, had a few nightmares and the occasional sleepless night, but have also had some real successes and achievements which we are proud of. Not to mention how many new skills we have both learnt, amazing how useful You Tube has become! We both feel very equipped and prepared for the next one, knowing what we will do differently or better next time. A vision of brown and avocado…. Restored and newly painted tile roof, new pergola and deck, new house colour, new exterior lights. The cedar shingles are a lovely nod to American design I love so much, and look great painted in this gorgeous deep grey blue. The charcoal gutters and downpipes add some contrast. The main bathroom was lined with pine Regency profile boards, with a tiny bath, vanity and slate tiles. Not to forget the stuck on faux-stained glass on the windows. We stripped the bathroom and added new walls, ceiling, flooring, custom vanity, wallpaper, shower screen and beautiful lighting. We removed all the picture rails in the house and replastered over the join, which was a mammoth job. But the result is more of a sense of elevated ceilings and spaciousness. The whole house has been repainted, with fabulous new feature lights throughout. 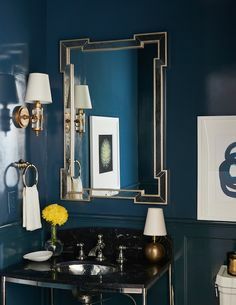 I am thrilled with the way the laundry and kitchen colour scheme came together, using these beautiful blue subway tiles combined with the brass accessories and sconces. We built the barn door which came as a plain door and we added the timber “Z” trim and black hardware. We ripped out the old kitchen and I designed a new U shaped kitchen which was custom made. We replaced all the flooring throughout. The lower cabinets are a mid grey with white upper cabinets, using a stone bench top and brass lighting and accessories. It also has a butler’s sink. I also designed an L-shaped banquette seating area which has custom made cushions to match, and this fabulous pendant over the dining table. We stripped out the entrance foyer, took out an old cupboard, and relined the walls in Hardie Groove V joint sheets. We added the timber moulding to all the doors, new door hardware and new architraves and skirtings, then finished off with fabulous lights and flooring. We also opened up the doorway through to the kitchen to create a nice open flow to the living areas. The studio which is attached to the garage had a tool shed at the back, which we decided to turn into a home office or other living space. So we lined the walls and ceiling with new gyprock, bought a new bigger window, added insulation and electrics, new lighting, flooring and painted the space. 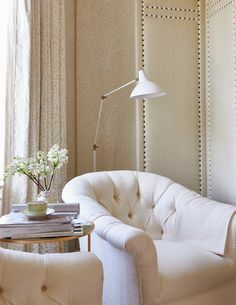 I had a few rolls of this stunning Thibaut wallpaper spare, so decided to use it as a feature wall in this space. It’s a lovely, inviting north facing room and will make a wonderful studio or work room for someone. We repainted the studio and garage, turned it into a liveable space, with new lighting, flooring, new barn doors and it’s a cute addition to the main cottage. This week we are finishing off the landscaping and new turf is being laid. We had a bit of a delay waiting for some warmer weather, as we didn’t want to lay turf during a frost. It has been absolutely bitter working outside all these months through a Highlands winter, but hopefully now that the buds and blossoms are bursting forth all over the Highlands, it should start warming put a bit. I’ll post more details of the before and afters once we are done and show how and what we achieved. It was a real hands-on experience, we had lots of laughs, a few tense moments, but thankfully Tom and I are still talking and still married! I can’t wait to retire my work boots, paint stained clothes, fleece and high-vis gear! And I so need a decent blow dry! We started this project on 1 May so to 1 Sept it’s been four months, and probably we should have done it in three, but as we have tried to reduce costs by doing a lot of the grunt work ourselves, that has slowed things up a bit. But it’s been a huge accomplishment although absolutely exhausting, and I’ve never had so many Epsom salts baths in my life as I have these past few months trying to sooth my weary and aching muscles. I also haven’t been so utterly physically shattered each night as I have doing this project, and certainly feeling every year of my age! We’ve been putting in 10 hour days since the start, working most weekends too, and the kids have become used to spending a lot of time here. Hopefully it will be worth the effort. I will also be styling and furnishing the cottage, so that there will be a complete furniture package available for the buyer to purchase which will include all the beautiful furniture, soft furnishings, blinds, curtains, artwork, mirrors, lamps, rugs and accessories that I have chosen to make it a stunning home ready to move into. It will be a busy week, but I am so excited to present the finished house in the next week. If you are interested in our Bowral cottage, or know somebody who might be, please send me an email and I’d be happy to send you more information. Well I can certainly see why you haven’t posted in awhile. You have been a busy little bee. What a stunning transformation Mel. The finishes are amazing. Such a labour of love. Looking forward to the end results. I think you’ve done an amazing job. Congrats to you and Tom. Looks stunning Mel! Really looking forward to seeing the end result! Wow, it’s lovely! You both have done an amazing job inside and out. Mel, this house looks like a beautiful labour of love. What you have both achieved in 4 months is amazing. Can’t wait to see the finished product! You should be very proud. So happy to see you back! As always, lovely. Melinda, a huge congratulations to you and your husband Tom, the cottage turned out BEAUTIFUL! Good luck on the sale! I love all the design choices you made. A lot of hard work went into this project but the results are beautiful. Well done you! Absolutely thrilled to see you back and wow.. as always a stunning transformation. You are forever inspiring. Congratulations on your beautiful work. Cannot wait to see finished. Beautiful. what a talented pair you make. Mel it looks absolutely stunning! What a transformation! Congratulations to you both on all your hard work, and please post and let us know when we can come and see it! We live in Beacon Hill and absolutely loved your North Balgowlah home! Hats off to you both, knowing how bitterly cold it has been this year down here and how hard it is for paint to dry in the cold, let alone doing all the rest! The only plus is at least it has kept dry. 4 months is a great effort, I’ve been talking about doing my ensuite for 4 years and still haven’t done it! I’m now eager to do a little drive by and see it for myself, now I know where it is. Amazing – congratulations Mel. The fact you have done all that in four months is outstanding. What an achievement. Wow looks gorgeous. Can’t wait to see it finished!! Love your style. Your work is truly Inspirational! You are so talented and I absolutely love everything you have done to this little house. All will be revealed at the workshops Teri. It’s a really wonderful makeover. Well done and thank you for sharing. Would you be able to do a list of colours, materials etc? I will be giving all that information away at the workshop I will be holding down here in October. Hi Rae, the bedding is my personal bedding bought over the years from Bed Bath n Table, West Elm, Serena & Lily and in the US.